You are about to enter a realm of pure insanity. When you listen to Another One Jumps Around, you will not be able to help yourself. You WILL get pumped up. You WILL jump around. You WILL dance. 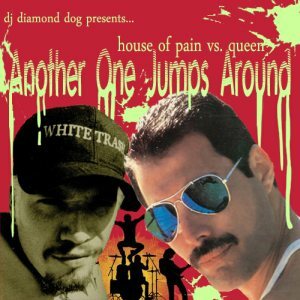 This purely adrenalized mashup features two timeless classics... Another One Bites The Dust (originally performed by Queen & Freddy Mercury) and Jump Around (originally performed by House Of Pain & Everlast). When combined, these 2 tracks take on a whole new original style. There is also a video for this mashup which can be streamed by clicking here. You can stream Another 1 Jumps Around directly or you can download it to your computer for free. The download also features a clean version, an explicit version and the mp4 video. Dark Horse is a chart topping success from Katy Perry's 4th studio album, Prism. It reached number one in several countries including the United States and also topped the Billboard Hot 100 as well as the Pop chart, tying Perry with Rihanna for the most number one singles. Dark Horse combines trap & hip hop with a touch of dubstep in it's production. The Dark Horse (rabid bootleg) retains all the original elements of production while adding verses from two chart topping artists... Flo-Rida & Pitbull... as well as keeping most of the original rap verse by Juicy J. For the DJ's: the Dark Horse (rabid bootleg) has an 8 bar intro and outro and has tags ONLY at the extreme beginning and extreme end, making it useful to mix in the club!! As always, you can sample and download Dark Horse (rabid bootleg) right here and at djdiamonddog.com. Be sure to share my mixes with your friends and add me on Twitter, Facebook, & Google plus! In the summer of 2006, the hip hop world got a huge hit from newcomer to scene, Rick Ross. Hustlin' was the first single from the new Miami-based rapper and was a prelude to his debut album, Port Of Miami. The track identifies with the cocaine distribution ring and became an instant classic upon it's release. 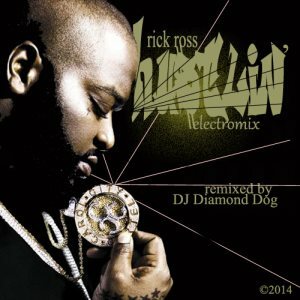 In the spring of 2014, nearly 8 years later, an electro version of this hip hop classic goes online at djdiamonddog.com. The "electromix" features a hard dance beat from the current hit Selfie backing up the original lyrics from Rick Ross along with some altered vocal effects to give it more dance appeal as opposed to it's original "gangsta" aura. As always, everything is free!! So sample Hustlin' (electromix) and download it for your music collection. The download link also features an acapella and an instrumental with chorus. For all my DJ's, the tags are there, but only at the very beginning and very end, so you can use this at your venues without hearing dj drops all over it.